Running a small engine repair business means being one part mechanic, one part environmentalist and one part - counselor? It's an aspect of his mobile engine repair service that Larry Matuszewski didn't quite expect. "I thought working for myself, alone, would be a lonely place to be," said Matuszewski, 58, who lives in Wauwatosa and owns Integrity Small Engine Repair. Instead, he said: "I get people telling me stories about moving on in their lives, past problems. You almost feel like a bit of a counselor. And it's great." The human element of his work has made Matuszewski's transition into mechanics much easier, especially since he started his business during such an economically uncertain time. Matuszewski retired in 2006 after working in new product development at Briggs & Stratton. He later took a job for a power equipment repair dealer before deciding he should start his own business. "I thought I could do things better," he said. 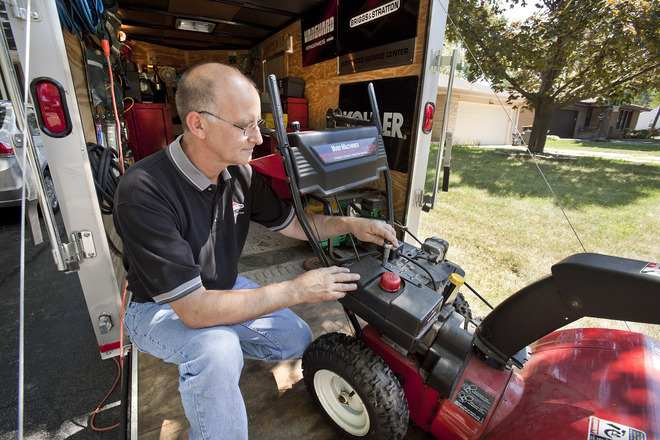 With his mobile service, Matuszewski prides himself on making repairs more convenient for customers. He strives to repair machines on the spot. If he can't, he aims to have your snow blower, lawn mower, chainsaw or riding tractor back to you within a week. Matuszewski believes business has doubled since his son helped him start a website. The visibility helps, but the business also seems to be thriving because people are looking to save money - whether that's via advice on an oil change or hiring Matuszewski to replace a coil. Some people still forgo even the smallest repairs in favor of new equipment. In those cases, Matuszewski repairs the machine and passes it along to a new owner. "It's green because you're not putting a piece of equipment in a landfill," he said. "It's very fulfilling." Still, it all comes back to people. "I just returned a snow blower to someone who plays Santa Claus for kids. Santa got his snow blower back," Matuszewski laughed. PEARLS OF WISDOM: "I want to treat people the way I would like to be treated."